Many presidents have exhibited senses of humor throughout our nation�s history. None, however, is any better known for his wit than was Lincoln. No matter the situation, it always reminded him of a story, and more often than not, the story was amusing. While Lincoln�s future was obviously not as a poet, his humor never seemed to fade, even under the most trying of circumstances. Following are some favorite Lincoln stories. Are they all true? Some probably are, some probably have been embellished. All are fun to read. President Lincoln had the ability to laugh at himself and he greatly enjoyed telling stories in which he was the object of the joke. He especially liked this one: �When I was nominated at Chicago, I had never before sat for a photograph. One fellow thought that many people might like to see what I looked like, so he immediately bought the negative and began selling photographs of me all over the country. I happened to be in Springfield when I heard a boy selling them on the streets. 'Here's your likeness of "Abe" Lincoln !' he shouted. �Only two shillings! He�ll look a lot better once he gets his hair combed !'" Lincoln gazed at his friends before continuing, "If (the cabinet officer) has a Presidential chin-fly biting him, I'm not going to knock it off, if it will only make his department go." One of Lincoln�s neighbors told how he went to his door one day to determine why some children in the street were shouting. He saw Lincoln walking past with two young boys in tow. "What�s the matter, Mr. Lincoln?� the neighbor asked. "The same thing that�s the matter with the whole world," Lincoln answered. "I have three walnuts, and each one of them wants two of them." Nobody Ever Died in Here! A man was complaining to the President that a friend of his had been expelled from New Orleans because he was a Union sympathizer. When the man asked to see the writ by which he was expelled, he was summarliy told that the Confederate Government would do nothing illegal, and so they had issued no writs. They were simply hoping to make him go of his own free will. Naturally, that reminded Lincoln of a story, and he remarked that he had known of a hotel keeper in St. Louis who boasted that nobody ever died in his hotel. �Of course,� Lincoln said with a twinkle in his eye, �Anytime a guest appeared to be in danger of dying he was carried out to die in the gutter." Lincoln replied, �I disagree. If you have an elephant on your hands that wants to run away, you better let him run." Secretary of War Stanton told the President this story, which Lincoln truly enjoyed. Lincoln particularly enjoyed stories at the expense of those in positions of authority, especially if they had no sense of humor themselves, which pretty well described Stanton. Stanton had been travelling by boat up the Broad River in North Carolina, and a Federal picket yelled out, "What are you carrying on that tug?" The answer came back, "The Secretary of War and Major General Foster." The picket replied, "We've got enough Major-Generals here. How about bringing us some hardtack?" Who Cares Who Started It? 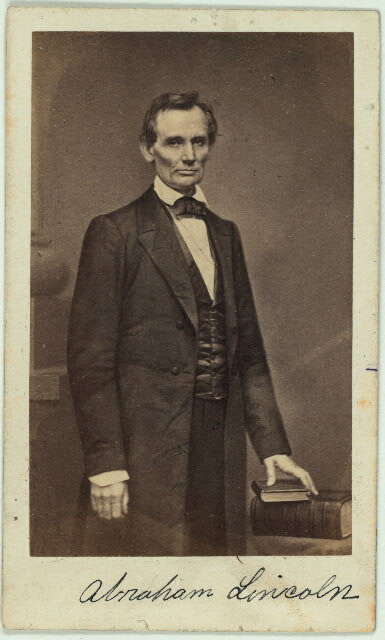 Lincoln was addressing some visitors, and he said, "Some Union supporters oppose any accommodation or yielding to the South in any manner because the Confederates began the war and should be held responsible. Now this reminds me of a good story I heard once, when I lived in Illinois�. "A farmer had a vicious bull that took after anybody who tried to cross the field. One day a neighbor climbed the fence and was soon running for his life. This man was fast, though, and he got to a tree with the bull close behind. There was no time to climb the tree, so he led the bull in a chase around the tree. He finally was able to grab the bull by the tail. The bull was now at a disadvantage. He couldn�t catch the man and he couldn�t shake him from his tail. The more they ran the madder the bull got. He pawed up the earth and bellowed until you could hear him miles away. Finally, he broke into a dead run, the man still hanging onto his tail. "That�s our situation here,� summarized Lincoln. �It's our duty to settle this fuss at the earliest possible moment, no matter who commenced it�. Lincoln told the story of a witness in court. When he was asked how old he was he answered, "Sixty." It was apparent that the witness was much older, so he was asked the same question again. His answer was the same. At that point the judge chastised the witness, saying, "The court knows you to be much older than sixty." The witness thought quickly, realizing he�d been had, and answered, "You're probably thinking of those ten years I spent in Maryland. That was so much time lost, I don�t count it." A friend visited President Lincoln and found him to be in a foul mood. "I�m afraid I have made Senator Wade of Ohio, my enemy for life," Lincoln said. "Wade was here just now trying to convince me that I should dismiss Grant, and, in response to something he said, I remarked that that reminded me of a story." "What did Wade say?" the friend asked. "He wasn�t happy," Lincoln answered. �Everything with you is story, story, story!� Senator Wade said. He said I was the father of every military blunder that we�ve made, and that I am on the road to hell and I am not a mile off this minute." "What did you say to that?" the friend asked. "I just said to him," the President chuckled, "Senator, that is just about the distance from here to the Capitol, is it not?" "He (the general) reminds me of the fellow who owned a dog which, he claimed, loved to fight wolves. The dog�s owner said that his animal spent its entire day tracking down and killing wolves. "One day a group of the dog-owner's friends organized a hunting party and invited the dog-owner and the dog to go with them. They soon noticed that the dog-owner was not excited about joining them. He said he had a business engagement, which greatly amused the others, who all knew that the man was so lazy that he would never have any reason to have a 'business engagement'. They ridiculed him to a point where he had no choice but to go along. "The dog, on the other hand, was excited to be going out into the woods, and the hunting party was soon on its way. Wolves were in abundance, and it wasn�t long before a pack was discovered. The dog saw the ferocious animals about the same time the wolves spotted him, and the chase was on. The hunting party followed on horseback. "The wolves and dog soon were out of sight, but the party followed the sounds of the chase. Soon they arrived at a farmhouse, where a farmer stood leaning against his gate. "�Did you see anything of a wolf-dog and a pack of wolves around here?� he was asked. "�How were they going?� came the next question. "�Well,' replied the farmer, �The dog was a just a little bit ahead.�"
"Now, gentlemen," said the President to his visitors, "that's exactly where you'll find most of these bragging generals when they get into a fight with the enemy." Lincoln found himself in a stifling courtroom one hot summer day, pleading his client�s case. The opposing lawyer, in a concession to the oppressive heat, took off his coat and vest as the debate went on. The man�s shirt had its buttons in the back, a style which was unusual even then. Lincoln looked at his opponent and sized up the man�s apparel. Knowing that the rural jury disliked pretension of any kind, or any attempt to show superior social rank, he said: "Gentlemen of the jury, having justice on my side, I don't think you will be at all influenced by the gentleman's pretended knowledge of the law, when you see he does not even know which side of his shirt should be in front." The jury burst into laughter, and Lincoln won the case. In August, 1864, the nation�s morale was low. The war was dragging on and the President had just issued a call for an additional five hundred thousand troops. The Presidential election was just around the corner and many of Lincoln�s supporters feared that the call for more men at such a crucial time would injure, if not destroy, Lincoln's chances for re-election. Lincoln�s response? "As far as my re-election," he said, "it matters not. We must have the men. If I go down, I intend to go, like the Cumberland, with my colors flying!" The speaker is Dr. Jerome Walker, of Brooklyn, who was showing President Lincoln through the hospital at City Point. "Finally, after visiting the wards occupied by our invalid and convalescing soldiers," said Dr. Walker, "we came to three wards occupied by sick and wounded Southern prisoners. With a feeling of patriotic duty, I said: 'Mr. President, you won't want to go in there; they are only rebels.' "I will never forget how he stopped and gently laid his large hand upon my shoulder and quietly answered, 'You mean Confederates!' And I have meant Confederates ever since. General George McClellan showed little respect for Lincoln. As time went on, his contempt for the President became more and more blatant, and he often kept Lincoln waiting while he transacted business with others. This discourtesy was so apparent that even McClellan�s staff seemed embarrassed by it, and it often drew comments from newspaper reporters. The President was finally asked about it. Humbly, Lincoln stated that McClellan�s disrespect was not a problem with him, if the slow-moving general would just initiate a battle. "I�ll even hold McClellan�s horse," the President said, "If he will only bring us some success." This is one of those stories which may or may not be true. Either way, it is the type of humor Lincoln loved and is something he easily could have said, if indeed, he didn�t. The story goes that Lincoln was stopped one day by a man who stuck a revolver almost into his face. Under the circumstances Lincoln quickly realized that any resistance was unwise. Trying to remain calm, he inquired, "What seems to be the matter?" "Well," replied the man, "A long time ago I swore that if I ever came across an uglier man than myself I'd shoot him on the spot." "Well," supposedly said Lincoln. "Go ahead and shoot me then, because if I am an uglier man than you I don't want to live." All the Candidates are Sick! All presidents are constantly besieged with requests for favors, and at no time are the requests more frequent than when an appointment is to be made. Lincoln was to appoint a Commissioner to the Hawaiian Islands, and eight applicants had filed their papers. A delegation made a personal appearance at the White House on behalf of a ninth candidate. The delegation was quick to point out that their man was quite capable, but more importantly, was also in poor health. Sending him to Hawaii, they reasoned, would be of great benefit to his health. Obviously, the President had heard this story before, probably more than once. He did not wish to hear the same story again, and he drew the interview to a close with this remark: "Gentlemen, I am sorry to tell that there are eight other applicants for this position, and I understand that everyone of them is sicker than your man." Lincoln often visited wounded soldiers in Washington area hospitals. In addition to inquiring about their health he often entertained the patients with his stories. He had just left one such facility when a visitor to the same hospital heard wounded soldiers laughing and talking about the President. The soldiers seemed in such good spirits that the visitor was curious, and he approached the bedside of one of the patients. "You must be very slightly wounded," he said to open the conversation. "Yes," the soldier replied, "Very slightly. I have only lost one leg, and I'd be glad to lose the other, if I could hear some more of 'Old Abe's' stories."